Meetings are held the second Tuesday of every month at noon. We are currently in search of a new meeting location. It will be announced shortly. PCBA members and guests are invited to attend the Annual Dinner on Friday, June 8th at 5:30 p.m. at the Country Club. Tickets are $35 per person and include your meal, 2 drink tickets, and entertainment. Tables of 8 and 10 are available for purchase. Cocktail hour will begin at 5:30, and a buffet dinner will be served at 6:30. Presentation of awards to begin shortly thereafter. Please join us in honoring Darol Biddle, this year’s Award of Merit recipient. 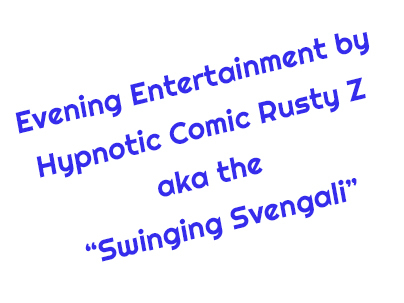 After dinner and awards, stay for a show presented by Hypnotic Comic Rusty Z aka the “Swinging Svengali”. Boasting a show that’s clean, comical, and a bit offbeat, Rusty Z assures participants a lively night of laughter and fun. Based out of Denver, he has toured the country and been featured on national television networks (Comedy Central and A&E) for his clever stand up comedy and stage hypnotism. Check him out at: http://www.rustyz.com/hypnosis/. Please RSVP by Friday, June 1st to Sarah Staples (sarah@stapleslawofficellc.com) or Lisa Macchietto (LMacchietto@pueblo.us). Buy your tickets on-line by clicking the Add To Cart Button, or you may send a check to the Bar Association at P.O. Box 802, Pueblo, CO 81002. Please include the name of your guest(s) in the note field. Buy your tickets on-line now.